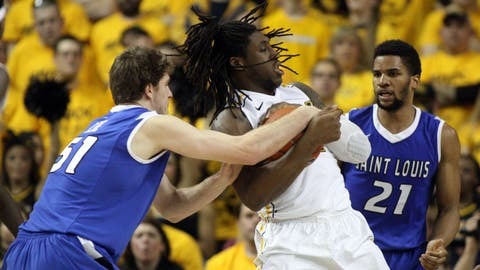 Billikens forward Rob Loe fights for the ball as Dwayne Evans looks on during Saturday's loss at VCU. RICHMOND, Va. — After going 88 days without losing, No. 10 Saint Louis has two losses in three days. Virginia Commonwealth took control in the first half and held on to defeat the Billikens 67-56 at the Siegel Center on Saturday, ending a three-game losing streak in the series. The Rams handed Saint Louis its second consecutive defeat following a school-record, 19-game winning streak. The Billikens were upset at home Thursday night by Duquesne, a 14-point underdog. With another chance to clinch at least a tie for the Atlantic 10 regular-season championship, Saint Louis again came up empty. The Billikens lead St. Joseph’s by one game with two to play. "Our kids responded well and played hard," Saint Louis coach Jim Crews said. "VCU played better. There were no pity parties today. It’s a good character trait for our kids, but we didn’t play well enough." It wasn’t easy for the Rams (22-7, 10-4 Atlantic 10), who never trailed but made just two of their first 13 shots in the second half. The Billikens (25-4, 12-2) weren’t much better, shooting 4 of 14 during the same 10-minute stretch. "I don’t think you’d want to take this game and turn it into any kind of offensive clinic and sell it on the Internet," VCU coach Shaka Smart said. "Offensively, it was a very similar game to (at Saint Louis). The difference was that we were much better defensively and on the offensive glass." Jordair Jett and Rob Loe helped Saint Louis stay within striking distance, but Juvonte Reddic made two free throws and hit Rob Brandenburg with a fast-break lob for a layup and a 55-43 lead with 6:33 remaining. VCU’s lead would not dip below eight points the rest of the way, with Reddic providing the exclamation point with a dunk with 1:10 remaining. Briante Weber added 13 points and four steals for the Rams. Jett led Saint Louis with 18 points. Austin McBroom had 11 points off the bench and Loe grabbed nine rebounds but turned the ball over six times. Leading scorer Dwayne Evans had just four points on 2-of-11 shooting after scoring 21 when the Billikens beat VCU 64-62 on Feb. 15 in St. Louis. Reddic scored 10 points for VCU, and Alie-Cox blocked five shots. The Rams took control in the first half with their "Havoc" press and ended a three-game losing streak in the series. Jarred Guest scored five points in an 11-3 spurt, putting back his own miss to start a three-point play. Guest then rebounded a missed 3-pointer and drew a goaltending call from Loe while being fouled. Guest couldn’t complete the three-point play, but Graham was there to put back the miss. "In the first half, their offensive rebounding was the biggest difference, and we turned it over a little too much," Crews said. "It was tough to get traction. They had a little bit more than us, but I don’t think there was any real traction in that game." Saint Louis shot 50 percent in the first half, but attempted only 22 field goals to VCU’s 36. Nine turnovers contributed to the lack of scoring opportunities as Graham collected three steals before the break. "I didn’t think we got sped up on most of those turnovers," Crews said. "We just turned it over. It was unforced errors a little bit. VCU gets you going a little fast, but our guys were firm and aggressive without being off-balance."